Syed Haider Raza became India’s priciest modern artist on Thursday when a seminal work by the 88-year-old sold for a whopping Rs 16.3 crore ($3.49 million) at a Christie’s auction in London. 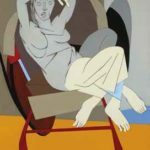 Just two summers back, a work by Francis Newton Souza had set the record for the most expensive piece of modern art by notching up $2.5 million or Rs 10.5 crore. Since then, prices of Indian art had crashed though the fall in contemporary art was much more drastic than the moderns. Aptly, it’s the country’s two best-known masters who are making the meltdown seem like a distant memory. “Strength is coming back to the art market. We are also seeing a lot of new bidders across the world from Hong Kong, the UAE and the US,” said Yamini Mehta, director of the contemporary Indian art department at Christie’s.